I started writing The Madman Theory when I was living in Massachusetts and made a trip down to the National Archives facility outside Washington to listen to Nixon’s White House recordings. At the time, it was the only way to hear these audiotapes. I also watched some of Nixon’s television appearances from the late 1950s and early 1960s. Between the two, I was able to get a handle on his mannerisms and the nuances of his speech. I also read every major book about Nixon and everything I could find on the other real characters who populate my novel. For the more obscure figures, I sought out oral histories and other sources that would give me a feel for how they would have behaved, had they been involved in the events I imagine in my novel. I read voraciously about the Missile Crisis and events that preceded it, including Kennedy’s secret recordings of his White House meetings during the crisis. And I spent an enormous amount of time reading newspapers and magazines of the period. What is one of the most interesting facts that you discovered while you were doing your research? The design of Air Force One that we take for granted today – the blue and white color scheme with large lettering spelling out United States of America – was done at the direction of President Kennedy. Prior to that, the president’s plane had a plain silver fuselage. In small letters by the door was the name of the military office that had the job of ferrying the president about. Since, in The Madman Theory , Kennedy doesn’t become president, the president’s plane remains unchanged. Did you intend for your novel to be released in an election year since the events in your novel are based on the alternate outcome of the 1960 election? I wasn’t timing The Madman Theory ’s release to coincide with an election year – but it’s a nice coincidence. The book shows what a monumental difference an election outcome can make. So, the timing is a nice bonus. 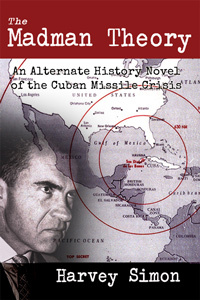 But I was shooting for the publication to line up with the 50th anniversary of the Cuban Missile Crisis this October. With any luck, the book will receive a little extra attention as a result of the anniversary. What has the road to publication been like for you and The Madman Theory? Do you wish you had done anything differently? It would have been great to have The Madman Theory published by Random House or another of the big publishing houses. They have the budget to get major publicity. Rosemoor Press, which published my book, doesn’t have those resources. The result is less attention. The point of writing a book is to get people to read it. And so to the extent that fewer people will know about The Madman Theory , that’s unfortunate. Which books would you say have influenced your writing – and life in general – the most? Advise and Consent, by Allen Drury, is one of the great political novels of all time. I came across it about the time I started writing The Madman Theory , and it made me want to write a great political novel. I was quite taken with the writing style, the story and the setting. The book takes place in Washington in the same era as The Madman Theory , and it helped to give me a feel for the culture of that time. I even found myself writing some of the same kinds of long, flowing sentences that Drury uses to such great effect. Currently I’m reading Tidewater Tales, by John Barth, which pretty much has nothing but long, complicated sentences. With any luck I won’t start writing my next book while I’m still reading Tidewater Tales. Thank you so much for answering these questions, Mr. Simon. In closing, is there anything you would like readers to take away from The Madman Theory? I would just like to encourage readers of The Madman Theory to contact me via the book’s website, TheMadmanTheory.com, with any questions about the book and to post their thoughts about the book on Amazon. 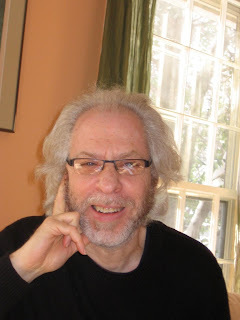 You can keep up with Harvey and his writing on his Website, Twitter, Goodreads, and Facebook. Don't forget to add The Madman Theory to your TBR list on Goodreads!